100 Meter Dash: 1. Hannah Rohde (SR,, Waukesha West) 12.44; 2. Gabby Beauvais (SO, Monona Grove) 12.45; 3. ToNaya Gulley (JR, Kenosha Tremper) 12.49; 4. Jackie Baldwin (SO, Kenosha Bradford) 12.57; 4. Bonnie Draxler (JR, Wrightstown) 12.57; 6. Aimee Rice-Strand (JR, Osceola) 12.61. 400 Meter Dash: 1. Hannah Rohde (SR, Waukesha West) 54.92; 2. Cassy Goodrich (JR, Union Grove) 56.05; 3. Tahtyana Peer (SR, Milwaukee King) 56.10;4 Bonnie Draxler (JR, Wrightstown) 56.19; 5. Sara Grange (SR, Grafton) 56.86; 6. Frankie Morris (SR, East Troy) 57.68. 800 Meter Run: 1. Rachel Atchison (SR, East Troy) 2:14.33; 2. Talia Spiegelberg (JR, Wisconsin Lutheran) 2:15.27; 3. Bridget Murphy (SR, Seymour) 2:15.33; 4. Courtney Kalous (SR, Milwaukee Lutheran) 2:15.85; 5. Madeline Brunner (SR, Belleville/New Glarus) 2:16.17; 6. Jennifer Parker (JR, Neenah) 2:16.21. 100 Meter Hurdles: 1. Danielle Riggins (JR, Kenosha Tremper) 14.23; 2. ToNaya Gulley (JR, Kenosha Tremper) 14.43; 3. Valerie Thames (SR, Milwaukee Riverside University 14.75; 4. Megan Linse (SR, Jefferson) 15.08; 5. Danielle Kohlwey (SO, Holmen) 15.11; 6. Brittany Dulak (SR, Mosinee) 15.14. 300 Meter Hurdles: 1. Valerie Thames (SR, Milwaukee Riverside University) 43.04; 2. ToNaya Gulley (JR, Kenosha Tremper) 44.86; 3. Danielle Riggins (JR, Kenosha Tremper) 44.98; 4. Amanda Wanie (SO, West Bend West) 45.58; 5. Jackie Butler (SR, Oshkosh West) 45.93; 6. Kathlean Wartman (JR, Arrowhead) 46.13. 4x100 Meter Relay: 1. Milwaukee King 48.51 (Sydnee Matthew JR, Marissa Cosey SO, Jaia Howard JR, Alexis Redd-Triggs JR); 2. Brookfield Central 48.86 (Cassie Jehly FR, Alissa Elwing SR, Jennifer Fox JR, Chisom Obasih SO); 3. Milwaukee Riverside University 49.18 (Endaisha Burks SO, Nyairah Abdullah SO, Traci Wood JR, Angel Malone SO); 4. Brookfield Academy 49.25 (Mary Liz Kim SR, Ugo Aguwa SO, Luisa Graf FR, Mackenzie Bonk JR); 5. Wisconsin Lutheran 49.27 (Billie Carter-Rankin JR, Hannah Kren SR, Erica Hallmann JR, Ambria Avery SR); 6. Osceola 49.31 (Bailey Ellefson SO, Alexa Stokes SR, Savannah Rivard FR, Aimee Rice-Strand JR). 4x200 Meter Relay: 1. La Crosse Logan 1:43.22 (Kemmesha Thomas FR, Ashley Sprain FR, Tore Washa SO, Chloe Malin SO); 2. Wisconsin Lutheran 1:43.31 (Billie Carter-Rankin JR, Hannah Kren SR, Erica Hallmann JR, Ambria Avery SR) 3. Bay Port 1:43.42 (Kayla Kolar SR, Paige DuBois FR, Ashleigh Buergi JR, Jenna Long SO); 4. Verona Area 1:43.81 (Shannon Kerrigan SO, Kylie Schmaltz FR, Katy Miller SR, Jenni LaCroix JR); 5. Wausau West 1:43.93 (Alyssa Faucett FR, Jasmin Samz FR, Meghan Peters JR, Hailey Deschaine JR); 6. Sun Prairie 1:44.05 (Tori Sharpe SR, Angie Konicek JR, Abby Millard SO, Tierney Lindner SO). 4x400 Meter Relay: 1. Milwaukee Riverside University 3:52.82 (Angel Malone SO, Helen Thames SO, Valerie Thames SR, Crystal Malone SR); 2. East Troy 3:58.45 (Carly Atchison FR, Katie Hodges SO, Rachel Atchison SR, Frankie Morris SR); 3. Notre Dame 3:58.70 (Kristen Burkel FR, Liz Markland FR, Carly Barton SR, Malorri Walczyk JR); 4. Whitefish Bay 3:58.75 (Grace Murray JR, Anna Bednarczyk JR, Hannah Fick JR, Kaitlyn Jackson FR); 5. Middleton 3:59.61 (Kayla Bauhs JR, Emily Zeker SO, Darcy Dean SR, Bobbi Patrick SO); 6. West Bend West 3:59.69 (Ife Ekunsanmi FR, Kayla Janto SR, Amanda Wanie SO, Erica Wanie JR). 4x800 Meter Relay: 1. East Troy 9:19.00 (Carly Atchison FR, Katie Hodges SO, Frankie Morris SR, Rachel Atchison SR); 2. Neenah 9:23.63 (Claire Knaus (SR, Jennifer Parker JR, Jessica Parker JR, 4) Alison Parker SR); 3. Dodgeville/Mineral Point 9:25.16 (Mairin Cahill JR, Mary Hanson SO, Kennedy Stumpf FR, Brittany Rhyner FR,); 4. Waukesha West 9:29.25 (Libby Horan SO, Carrie Brick FR, Megan Bur SO, Emma Langer FR); 5. Eau Claire Memorial 9:29.61 (Elena Smith SO, Catherine Luo SO, Heidi Hujik SR, Aubrey Roberts FR); 6. Middleton 9:31.20 (Bobbi Patrick SO, Darcy Dean SR, Rachel Wians SO, Samantha Valentine FR). High Jump 1. Khadiya Hollingsworth (SO, Brookfield East) 5-07; 2. Lexi Chanos (12, Edgewood) 5-04; 2 Alexis McKeever (JR, Mukwonago) 5-04; 2 Steph Pladies (SO, Mukwonago) 5-04; 2. Taylor Stanek (SO, Dodgeville/Mineral Point) 5-04; 6. Haley Hazlett (SR, Wild Rose) 5-03. Pole Vault: 1. Bonnie Draxler (JR, Wrightstown) 12-06; 2. Rayce Albino (SO, New Berlin West) 12-03: 3. Nicole Larson (SR, West Allis Central) 12-00: 4. Taylor Amann (JR, Arrowhead) 11-06; 4. Taylor Corkum [SR, Wisconsin Lutheran) 11-06: 4. Alex Flucke (SR, Ashwaubenon) 11-06: 4. Lily Hayes (JR, Whitefish Bay) 11-06: 4. Mandy Sinkler (JR, Mukwonago) 11-06: 4. Kylie Swiekatowski (FR, De Pere) 11-06. Long Jump: 1. Ngozi Musa (SO, Divine Savior) 18-08.75: 2. Micaela Creighton (SR, South Milwaukee) 18-07.75: 3. Gabby Beauvais (SO, Monona Grove) 18-04.75: 4. Morgan Johnson (JR, Hayward) 18-04.75: 5. Jenna Ladsten (SR, Blair-Taylor) 18-04: 6. Abby Scharbarth (SR, Lakeland) 18-01.25. Triple Jump: 1. Mikayla Robertson (SR, Menomonee Falls) 40-04.00; 2. Natisha Hiedeman (SO, GB Southwst 37-09.75; 3. Amber Williams (SR, Milwaukee Hamilton) 37-06.7; 4. Sydnee Matthew (JR, Milwaukee King) 37-03.75; 5. Melissa Kirchoff (JR, Franklin) 37-00.75; 6. Taylor Weis (JR, Kettle Moraine) 36-10.50. Shot Put: 1. Kennedy Blahnik (JR, Algoma) 49-01.50; 2. Kiley Sabin (JR, Slinger) 43-04.75; 3. Annalese Lamke (SO, Gale-Ettrick-Trempealeau) 41-03.00; 4. Katie Cihlar (SO, Wausau West 41-01.50; 5. Kendra Antony (SR, Melrose-Mindoro 40-06.25; 6. Kamry Gipson (SR, Sun Prairie) 40-02.75. Discus Throw: 1. Kennedy Blahnik (JR, Algoma 154-03; 2. Corinne Franz (SR, Madison Memorial) 143-10; 3. Kiley Sabin (JR, Slinger) 130-00; 4. Sam Noennig (FR, Hartford) 126-09; 5. Genevieve Gates (SR, Sheboygan Falls) 126-08; 6. Mallory Nickerson (SR, Pulaski) 126-08. To qualify for the Wisconsin Track Coaches Association All-State Team, athletes had to finish in the top six for all three divisions combined in the finals at the WIAA State Meet 2013. 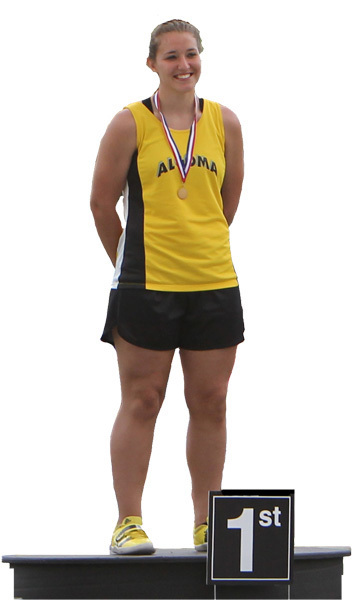 The Wisconsin Track Coaches Association has chosen Kennedy Blahnik of D3 Algoma as the 2013 Female Athlete of the Year. Blahnik has won six Gold Medals in her first three years of WIAA State Meet competition. This past season she again won the discus and shot put events setting new D3 records in each event. Kennedy Blahnik had set the D3 discus record with a throw of 150' 07 at the 2011 State Meet. This past season she bettered that with a launch of 154' 03 to set a new D3 discus record. 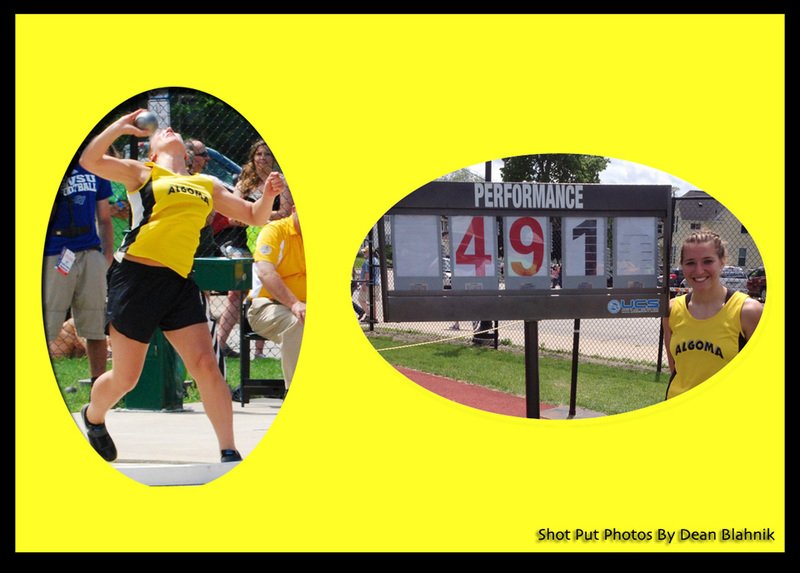 Blahnik broke the D3 SP record she set in 2012 [47' 11.00] by throwing the shot 49' 01.50 at the 2013 WIAA State Meet. She has set new SP records in 2011-13 [47' 00,25, 47' 11.00, and 49' 01.50]. Blahnik who maintains a 4.0 G.P.A. and is a Class Officer at Algoma helped her team to a fourth place finish in D3 at the 2013 State Meet. Blahnik an Algoma senior has orally committed to compete for the Wisconsin Badgers on a Track and Field scholarship.